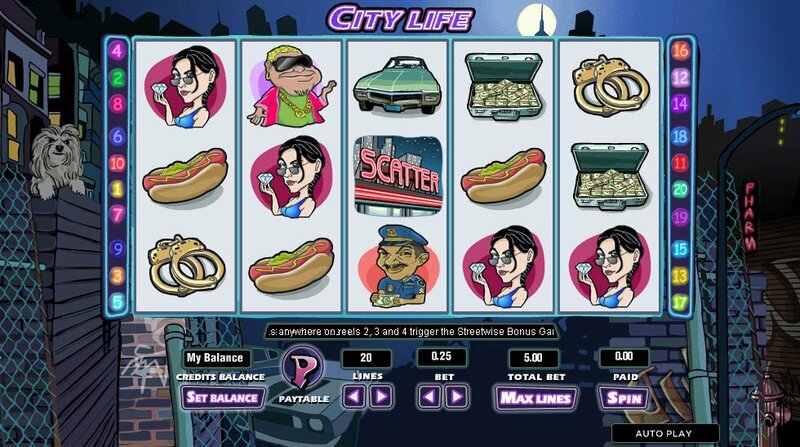 A slice of life in the city, the City Life slot game has a host of shady characters, some random food items and highlights some underhanded dealing going on. There’s a cool bonus game feature and some nice wilds, along with some funky music. What’s not to like? This slot gives us a slice of the City Life as we take to the streets to get the low down on what's going on outside our cozy houses and the reach of our wifi signals. 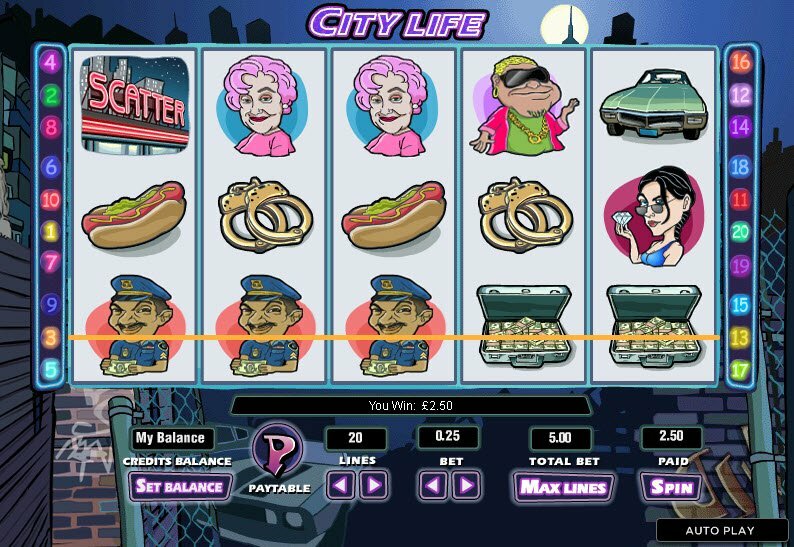 Night-time can be a dangerous time on the streets of any major city, and the City Life slot game is no exception. There's a sleazy businessman character, a greedy cop accepting a backhander, a bar butterfly, complete with cocktail in hand. Let's not forget a sweet looking old lady and blinged out gang member. Quite a host of characters make up the City Life slot graphics. The harsh strip bulb lighting that graces most cities makes up the scatter symbol. There's also a random hotdog, can anyone say processed meat? Some handcuffs, a briefcase full of cash and a vintage style car. As the reels spin, we are treated to some musical accompaniment, tambourine, mysterious overtones, and then, as soon as they stop and a payline or two are born the music congratulates you by going funky. The sounds of a cool, underground smokey jazz club come to life, with the drumbeat ending you would expect from 70's comedies. The harsh strip bulb lighting that graces most cities makes up the scatter symbol. 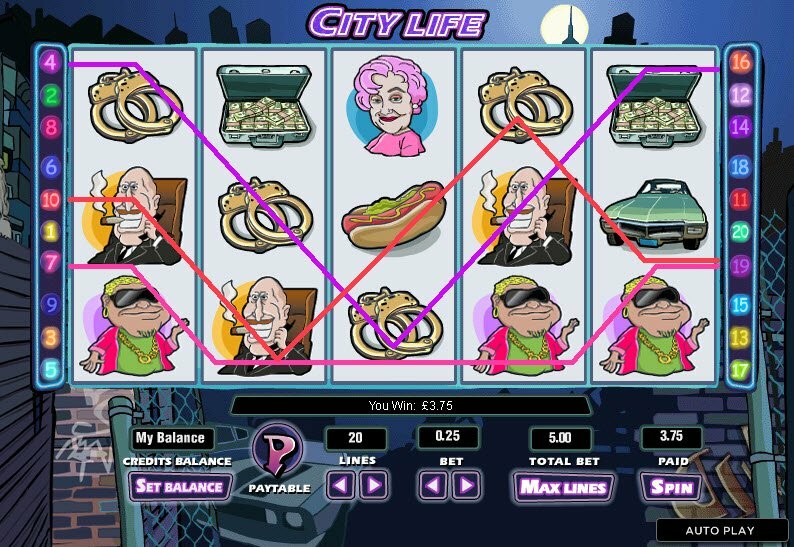 If two are found in this 5 reel 20 payline City Life slot, it will multiply the total bet amount. Let's go wild for the City Life slot game with this substitute for any symbol, helping you win more payouts, and not to forget the Wild x 3 symbol that will appear only on reel 3 and triple your payline winnings! Lastly there is the City Life slot bonus lit up in lights that will trigger the Streetwise bonus game. In this feature, you will embark on an adventure in the shadiest part of town and encounter 5 hoodlums with some serious con artist skills. Win a City Life reward payout of coins for correctly matching up stolen merchandise and outwitting the conman. -What's with the random hotdog?